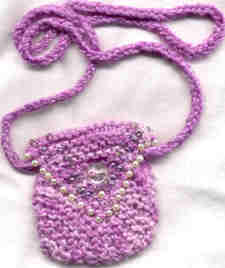 This simple design can be dressed up with beads and served plain showing off this homegrown yarn’s natural beauty. Its message is simple, too. Take care and be careful. Gauge: approx. 4.5 stitches and 8 rows per inch. Test your guage as you knit. If body is too small, add stitches, too large, subtract. Repeat Row 3 until you have 18 stitches on the needle. This is half a square. Make two squares and sew then together on three sides. Now you will begin the flap, which is the half square. Finish knitting in same manner as square. Strap: Pick up 2 stitches on one side of flap and knit for about 24 inches. Bind off and attach. Finishing: Sew button on and bead as desired. Or not. Michelle Edwards, a lifelong knitter is the author and illustrator of many books for children including the 2006 Gryphon award winner, Stinky Stern Forever. Her essays about knitting and life appear in the Lion Brand Company Newsletter and can be read online here. She lives in Iowa City, Iowa with her husband and three daughters. She can be contacted at www.michelledwards.com.